MACOMB, IL – A multi-faceted addition to the College of Fine Arts and Communication (COFAC) Recital Hall will expand the ability and size of audiences who can see voice and instrumental productions being performed in the facility. 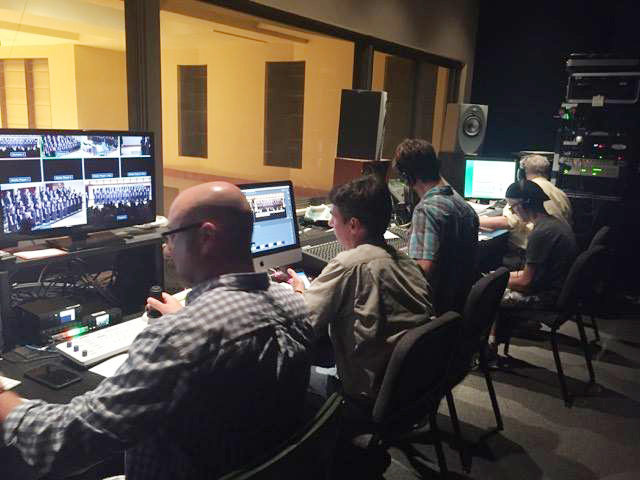 Over the summer, the capability to provide live video streaming was added to the recital hall's booth space. The move means productions can now be seen by a worldwide audience. "This was a conversation and collaborative effort over many months," said WIU School of Music Director Tammie Walker. "Now we feel like we can be more competitive; some of our frustration was not being able to show what we can do." The streaming effort first began with a WIU broadcasting student live streaming with one camera from one of the recital hall's balconies. "We found we needed an expanded system built into the recital hall," said WIU Music Professor John Cooper. "We got some great minds together at University Television and that has been a huge resource." Walker said the streaming program is a "work in progress" and is run by student workers who handle each performance. "For our School of Music student workers, this is really a wonderful opportunity," she said. University Television Production Coordinator Phil Weiss and Chief Broadcast Engineer Michael Morrison helped the School of Music coordinate equipment purchases and installation. The process now includes four cameras, that rotate silently, and the infrastructure it takes to operate the system. "All of the cameras operate remotely, which is something Dr. Walker asked for," said Weiss. "The booth is a controlled environment with as few people as possible. We're right there with them, and we are able to do anything a big university can do. It really is a great recruitment and retention tool." Walker said it is amazing that the school is able to be a front runner in its social media and YouTube efforts. "People are noticing, and that was the goal," she said. "Our outreach has increased tenfold. Now we have an audience of thousands, where before we had a few hundred." Walker said the number of auditions scheduled by prospective students and interest in the School of Music has increased over the last year. "At this point it's hard to tell what is guiding that, but one of our biggest challenges is isolation," said Walker. "It is hard for us to be known by word-of-mouth, but this streaming is taking away that isolation element." Cooper said the improvement is driven by changes in how many people worldwide are demanding to receive their news and entertainment. "They can watch programs on demand now, and most viewership is happening in that way," he said. "This service allows us to catalog the productions and most of our views are after the production is over. But this is also a wonderful resource for parents who can still see the productions live and don't have to drive so far to see their students perform." Cooper said he envisions using the streaming process to broadcast WIU music clinics and to find a way to make the process interactive for the audience on the other end. "We would like them to remotely participate and be able to ask questions," he said. Walker said the streaming addition is also an important tool in the School of Music's ability to attract new students. "Parents are excited to know they can tune in and see their student performing," she said. "That's huge, and we refer our prospective students to YouTube so they can get a sense of what our ensembles are like." 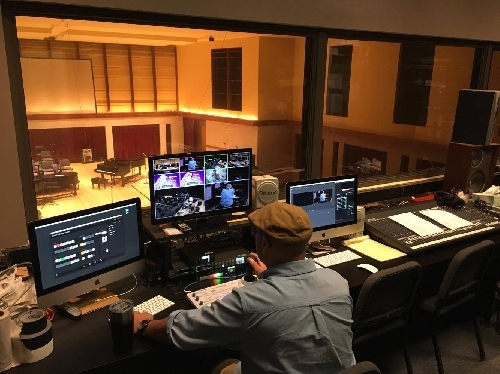 Most COFAC Recital Hall performances can be streamed, as well as solo recitals students must perform before they graduate; but students have the option of whether or not to stream their performance. Cooper said the pedagogical implications streaming offers are another important facet. "Because this music is being streamed live, the musicians realize the need to raise their performance level because their performances will be open to a world audience to play as many times as they want," said Cooper. "In some ways, it is a return to live television performance practices that happened in the 1950s. Musicians just had to be perfect." In Summer 2018, Walker said the School of Music will offer a camp for high school students to learn the live streaming process. More information about the camp is available at bit.ly/2xSkZPf. Thanks to the WIU Foundation, live streamed events include a digital mechanism for viewers to donate to the School of Music. This feature was used for the first time at September's annual School of Music Scholarship Concert. "Those funds go directly to scholarships for current and future students," said Walker. The live stream can be accessed on YouTube at bit.ly/2wTtPa3 or on Facebook at bit.ly/2yCk848. For more information about the streaming process, email the School of Music at music@wiu.edu.